– All our prices are inclusive of the current rate of VAT and include all relevant promotional discounts. – Goods will remain the property of i-Home Interiors Ltd until full payment has been made and cleared at our bank, but the risk lies with the client once delivered. ‘The Late Payment of Commercial Debts Regulations 2002’. – All visuals are provided on condition that they are accepted as an artistic interpretation only, and not intended to offer an actual representation of the proposed kitchen. – Furniture and worktops are non-returnable as they are made to order. – Appliances, sinks, taps and lighting – if boxed in original packaging they are returnable but subject to a 25% handling charge; if unboxed they are non-returnable. – Handles are non-returnable once fitted. If they have not been fitted then a 25% handling charge will apply. – The minimum value of items you can return is £25. 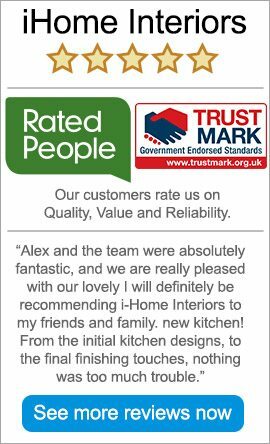 – In the unfortunate event that damage occurs to your kitchen after being signed off, we are able to replace most items at a preferential rate. – Timber & Granite are natural materials and therefore colour and grain variations may occur. This is part of the beauty and nature of these materials. It should, therefore, be understood that the client accepts this possibility and that as such; no payment will be withheld, or free of charge replacements requested in relation to this. – Where worktops abut, the maximum joint width should be 1.5mm +/- 0.5mm. Where worktops abut splash backs or vertical wall lining the joint should be a maximum of 3mm. – Joints between splash backs or wall lining pieces should be 1.5mm +/- 0.5mm. Where joints are to be sealant filled, these will need to be a minimum of 3mm. – All joints should be parallel unless specified. The arises of the joints at abutting stones should be free from chips, spalls and cracks. – Where upstands and splash backs are being fitted, the gap between the horizontal surfaces and backing wall should be no greater than half the thickness of the splash back. Where no splash back is being installed, the gap should mirror the profile of the wall and be no greater than 6mm. – Small chips at the joint edges are common in fabrication of granite because of the relatively large crystal size. Selecting a stone that is less prone to damage can reduce the likelihood of chipping. If the customer stipulates limitations or no chipping then the use of stone may be considered inappropriate. – Unless a charge has been implemented in the original contract, the Client is responsible for the removal of the existing kitchen, and for providing all the relevant services to suit the new layout. – All builders’ work, decoration and tiling to be by Client, unless otherwise stated. – Plinths will be fitted to suit the thickness of the floor finish. Any need to refit plinths removed by others after the Practical Completion of the furniture installation, will be subject to an additional charge on a Day-Rate basis. – The Client must give at least 10 working days notice of any delay required to the agreed installation date. If such notice is not given, the Client will be totally responsible for any additional costs i-Home Interiors Ltd has to bear as a result of this. – Regardless of notice the client will incur storage charges of £100.00 (as a one-off payment) an additional weekly storage charge of £25.00. – Subsequent rescheduling of the installation, after a Clients notice of delay, will be subject to available dates within i-Home Interiors Ltd Installation Schedule. – Although the earliest date possible will be offered, no guarantee can be given that this will be quicker than the standard 6 week call-off period. – It is the responsibility of the Client to ensure that the provision of suitable gas & electrical services are available at the time of delivery of Range type cookers. – If, due to unfavorable site conditions, either the delivery or connection is unable to occur, then there will be an additional charge of £100.00 payable by the Client. This charge will be levied for both delivery and connection. – Under the Health & Safety act, it is the Client’s responsibility to ensure that they provide close, safe and suitable access to the area of the installation. If this is not available, the delivery will be aborted and an additional delivery charge will be levied. – Any damage suffered by the goods as a result of assistance being given by the client to necessitate suitable delivery will be borne by the Client. Any damage whatsoever caused as a result of our delivery must be notified to the driver and i-Home Interiors Ltd office at time of delivery. – i-Home Interiors Ltd aim to deliver promptly, however due to reasons out of our control, there may be inability to deliver on the selected delivery date(s). – We will not take liability for any losses incurred as a result of late delivery. – Upon practical completion of each stage of installation, our installer will request that the Client (or their representative) sign off their work to ensure complete satisfaction. The maximum amount of time we give for this is 7 days, thereafter all items become chargeable. – The design is based on standard installation parameters, especially in relation to the quantity of cornice, light pelmet, plinth, materials for infills and the like, worktop edging and worktops. Therefore, the Contract cost is for the project as a whole. – i-Home Interiors Ltd are unable to accept such surplus items, as above, for return and credit after delivery. – Twelve months from the date of Practical Completion. – This does not invalidate any special extended guarantee periods offered by the initial manufacturer. – This guarantee does not cover fair wear and tear, neglect or misuse of your goods. – Manufactures reserve the right to make changes to products and technical data without prior notice and from time of order to supply there may be change of specification without our knowledge or the quoted produced maybe superseded in this case i-Home Interiors Ltd cannot be held responsible. -It is the responsibility of the Client to provide adequate electrical power and lighting on site. – All plumbing & gas services to be by Client. – All final gas connections to appliances to be by Client. – Final connections where charged for, include all final water & electrical connections from appliances supplied by i-Home Interiors Ltd to be undertaken by them (but only if suitably positioned and terminated adjacent services have been provided by the Client). On condition that the relevant services are operable at that time, such appliances will be subject to a test cycle. If the lack of services result in the connections and/or tests being unable to be undertaken, the Client will be totally responsible for any problems which may arise from such. Any related subsequent return visits by i-Home Interiors Ltd will be on a Day-Rate chargeable basis. – Provision of a hole through the external wall for the extractor ducting, to be by Client. – Provision of ceiling fixing plate and related ducting through ceiling void, for suspended island chimney extractors to be undertaken by the Client. – Only a minimal scribing tolerance is allowed for in the furniture carcasses and panels. Therefore any gaps between the units/panels and wall surfaces which are the result of wall surfaces not being flat, perpendicular; will be the responsibility of the Client. – It has been assumed that the installation of the furniture and appliances will be undertaken at the same time. Thus no allowance has been made for the additional cost of any subsequent visit to install the appliances after completion of the furniture installation. Should site conditions prove impractical for appliances to be installed, or at the request of the Client; any resultant return visit to undertake appliances installation will be a Day-Rate chargeable basis. – Where applicable, a minimum period of 10 working days should be allowed between the templating for Granite/Caesarstone/Glass worktops and their subsequent installation.